Stunning carpet and also only one piece available in Rugs and Beyond rare collection. 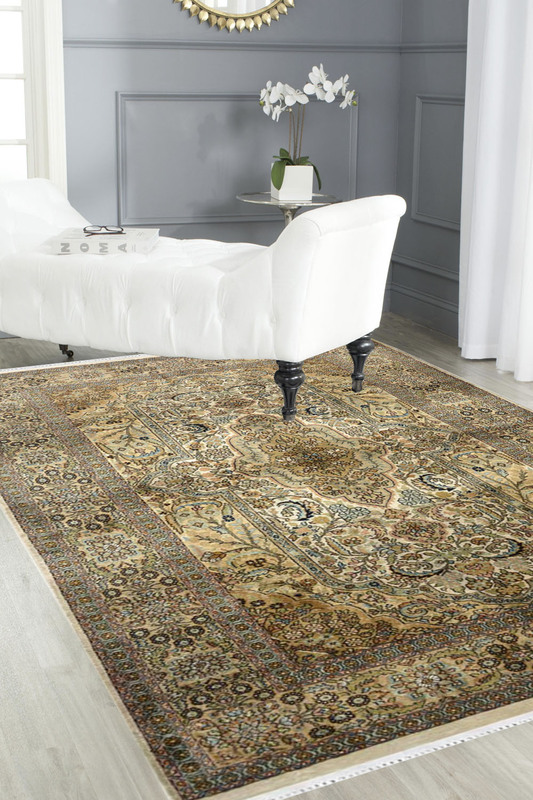 This is hand-knotted in pure silk, this rug flaunts intricate pattern in a floral pattern. It has a very smooth color which looks really nice with any brighter color furniture. This is absolutely ideal for living area. - Yes this is a masterpiece of traditional design and has 600 knots per square inch. - The "Victorian Medallion" has rich color with a unique color combination. - This is pure silk on silk carpet. The ground in pure silk and top of this carpet also in silk. - The resource of silk is China and implement this beautiful design by our skilled craftsmen. - It has extremely very fine quality with the really very difficult pattern. - This is "One of a kind" carpet. You can never find the exact same design in all over the world. - The beauty of this carpet is that it has subtle colors and the design is extremely intricate and detailed. - Rugs and Beyond highly recommends this masterpiece.